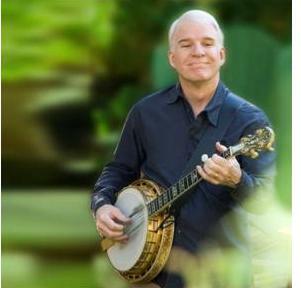 Steve Martin is a Grammy Award winning and critically acclaimed bluegrass musician who has played with Earl Scruggs, Edie Brickell, and even Kermit the Frog! The Kennedy Center Honoree, AFI Lifetime Achievement Award and Mark Twain Prize for American Humor recipient performs with acclaimed Grammy winning band and longtime collaborators the Steep Canyon Rangers with a host of Americana hits and audience favorites. The Huck Finn Jubilee audience will be in for a hard-charging spectacular of traditional and progressive tunes. Cucamonga-Guasti Regional Park in Ontario, California will be the site for this annual event June 12 thru 14, 2015 when thousands of bluegrass and jamgrass fans arrive to partake in a family friendly festival that celebrates traditional music, education, activities, and the evolution of bluegrass music. Tickets are on sale now with several options to satisfy all attendees; prices start at $49.00. Options to purchase VIP tickets, 3 day and single day passes or reservations for camping or RV sites and hotels are available on line at http://www.huckfinn.com. Huck Finn Jubilee is produced by The Greater Ontario Convention & Visitors Bureau , the official destination marketing organization to promote the cities of Ontario and Rancho Cucamonga California to visitors nationally and internationally. Established in 1975 at the hands of a homegrown, Southern California family, the Huck Finn Jubilee Bluegrass Music Festival is a three-day gathering of true bluegrass and jamgrass music lovers. It is a genuine embodiment of endless pickin’ parties, instrumental roots education, and bands performing to fans that believe in the core value that bluegrass is about more than just the music. It is a community- one that delivers the nostalgia of music-driven campgrounds, bare feet, laughter, dancing, instrument exploration, and the development of new friendships.